PRESS: What they're saying about "Overqualified for the Blues"
"Brian Blain has probably never toiled behind a mule or been mistreated by Mister Charlie, but he has paid his blues dues. His computer is underpowered ("Hi-Tech Blues") and his line of work is being threatened ("Blues Is Hurting," "One More Weasel"), so he takes out his frustrations musically a la middle-class white boy Mose Allison. This Toronto-based Quebec native, a longtime fixture on the Canadian acoustic blues scene, writes ironic, biting lyrics that are equally funny and insightful. His instrumentation might include his own acoustic guitar plus a lead player, bassist or harpist, but even his percussionists are in the background on "Overqualified for the Blues," a triumph of minimalism." "A personable singer and a good accompanying guitarist, Brian Blain is a superior songwriter who writes lyrics about everyday life. His delivery is friendly, his words are insightful, and there is plenty of variety in the subject matter throughout this mostly joyful set, not just dealing with the usual love relationships. 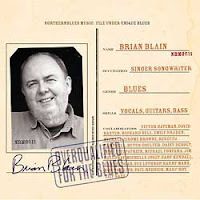 The backup musicians are excellent, but Brian Blain is in the spotlight throughout and performs a definitive set of his material. This set is particularly recommended to fans of upbeat folk music." "A brilliant writer incorporating everyday experiences and situations into his lighthearted blues songs...Brian Blain could put a smile on a gargoyle." "Overqualified For The Blues" has garnered considerable airplay in the U.S. and Canada with tracks in rotation on Galaxie and JAZZ-FM. 2005 Recipient - "Golden Quill" Porcupine Award from CIUT-FM "Back to the Sugar Camp" www.backtothesugarcamp.com The citation reads: "Brian has the ability to utilize a musical genre but not be limited by it when he composes his precious songs. He uses the blues and yet his songs weave in and out of them. Incorporating modern day life that fits in perfectly with this over-used musical style, he brings going to meetings, dating a girl with a Saab, or being a high tech guru with a slightly humorous detachment. He is the Buddha of the Blues."